The green Revolution solved the problem of shortage of food grains to quite an extent but it also led to major utilization of water, electricity and chemical fertilizers. This has resulted in the shortage of water and electricity for farming and also affected the quality of soil since the naturally occurring organic matter has been depleted beyond means while causing an alarming increase in the chemicals in the environment. Increase of chemicals in the environment including air, soil and water and resulted in increase of number of health hazardous diseases. These diseases affect human, animal and plant life. Cut down on the use and cost of chemical fertilizers and pesticides. Increase the biodiversity of insects and microorganisms that perform natural pest control thus decreasing the dependence on natural pesticides. Reduce dependence on ground water and farm power for irrigation. Many organically grown crops do not need regular watering and can sustain themselves on the rain water itself. Utilize crop residue for preparing organic fertilizers. This way one need not get into the hassle of buying expensive chemical fertilizers while giving providing complete organic care to the crops. The many benefits of organic food have already been established and it is little wonder then that everything organic has taken the food world by storm. However, while the organic food is good for our health, how does it help the farmers who turn to organic farming? There are many NGOs working at international level to help establish food security for the farmers and their families through organic farming. Aside from the health benefits, organic food is fast becoming a cost effective and sure way of helping many poverty stricken families get their three daily meals. Farmers are being asked to adopt the technique of organic farming to feed their families and reduce the expenses incurred on food. Organic farming also helps increase the yield of crop as well the monthly income. The benefits of turning to organic farming are many for the farmers themselves. The expense on costly chemicals, pesticides and insecticides is drastically reduced since all these are not used at all in organic farming. The farmer can keep some share of the organic food for his family that will help in providing adequate nutrition to his growing children. In poverty-stricken families malnutrition is a major health concern in children as well as in women who have attained puberty and are of reproductive age. The farmer growing organic crops benefits economically as well. The cost of chemicals is nil since they aren’t used and organic foods are sold expensive in the food market that helps the farmers increase their level of income. Organic Farming has already been established as the better form of farming since it does not make use of pesticides, insecticides and other harmful chemicals for growing crops. Organic foods including organic milk and organic fish do not contain any traces of chemicals in them and are therefore, healthier and more nutritious than foods that are grown by injecting chemicals into them. Also, many people can vouch for the better taste of organic foods. Apart from the health benefits, switching to organic farming can help reduce the environmental pollution as well. By reducing our dependency on chemicals we can make the air cleaner and fresher but more recently it has been proven that organic farming can help control and reduce global warming as well. Organic farming makes use of the conventional methods of farming that can rescue the world from the harmful effects of global warming. While doing organic farming one can save up to 40 per cent of water alone since organic crops do not have to depend on water pumps for frequent irrigation. 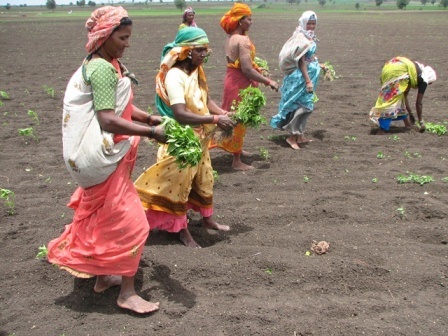 Many farmers have confessed that they do not need to irrigate their farms for 20-25 days at a stretch and that it doesn’t bother them much if the monsoons get delayed by 15-20 days. The summer crops grown by using organic farming techniques can go without water for up to 30-35 days. By reducing dependency on water we can help global warming and also save enough water to help the drinking and cooking needs of an entire village for the next 20 years on an average. Organic Food and Locally Grown Food – Are They the Same? Organic food has taken the food industry and the supermarkets by storm. The consumption of organic food has increased many times over in the past couple of years. The reason for this is simple; more and more people are realizing and agreeing to the benefits that organic foods have over non-organic ones. However, today the market is flooded with many brands that offer locally grown foods under the guise of organic foods. This has left many consumers asking whether organic foods are the same as locally grown foods or not. Let us understand first what organic food is. Food that is grown without the use of chemicals, pesticides and insecticides is termed as organic food. Farmers use natural manure and mulch instead of chemical solvents to grow their organic crops. Other organic foods products such as organic milk, organic meat and organic fish are also processed from everything natural and from that which has been grown in totally natural environments. In other words, organic food products are completely free from any kind of chemicals. Organic food products are not the same as locally grown food unless the latter has been grown using organic farming methods. Locally grown food may involve the use of chemicals such as insecticides and pesticides for the protection of the plants and to help them grow. Just because you have been growing the food in your vegetable garden does not make it organic. There are strict measures that need to be employed when cultivating organically grown crops. The bottom line is you need to be sure that you are not buying locally grown food that is being marketed as organic food.